"This is a lovely sweet-and-sticky meal without the guilt the family whole family will enjoy. If you are cooking with rice or another side that takes awhile to cook, prepare that first." 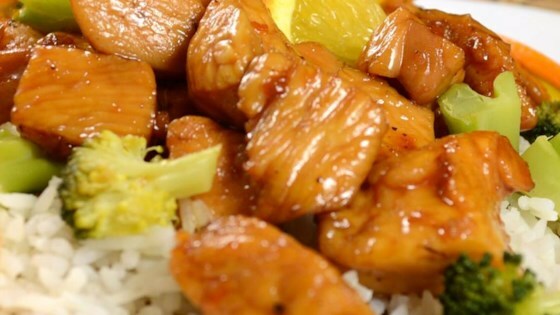 Combine chicken, orange juice, soy sauce, honey, garlic paste, ginger paste, and black pepper in a large nonstick skillet over medium-high heat. Cook and stir until the sauce reduces to a sticky glaze and the chicken is cooked through, about 20 minutes. ERR MER GERD!!! This was amazing...smelled so so good, tasted awesome over rice.